After Brexit forced David Cameron to fall on his sword, “Leave” campaigners Boris Johnson and Michael Gove were expected to scrabble over his throne. But neither man felt inclined to clean up the mess he’d made, so two women stepped up to the fore: Energy Minister Andrea Leadsom and Home Secretary Theresa May were expected to wage a nine-week campaign for the Tory leadership. But then Leadsom suggested that “being a mum” meant that she had a “real stake in Britain’s future” — as opposed to May, who does not have children and thus, presumably, just wants to watch the world burn. May was a quiet supporter of “Remain” but has sworn to honor the referendum’s result. 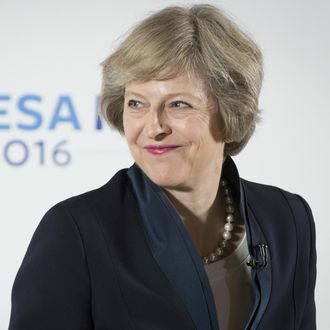 “Brexit means Brexit and we’re going to make a success of it,” she said Monday. The home secretary has taken a tough-on-immigrants stance in recent weeks, refusing to guarantee that EU citizens currently living in the U.K. will be allowed to stay and suggesting that future immigration could be limited to those making more than £35,000 a year.